This post by guest contributor Nassim Nobari is the second in a series exploring the cultural, economic and health implications of distributing milk and other dairy products as food aid in communities where dairy is not traditionally consumed. 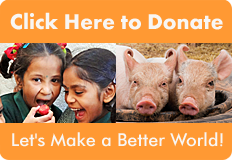 As we have noted elsewhere, Heifer International and other hunger relief organizations have long promoted dairy consumption and production in countries where much of the population is lactose intolerant, and despite the fact that native plant crops are capable of producing equal or greater amounts of protein, calcium and other nutrients. As Mexican food systems are incorporated into the global economy, rapid changes are underway in the dietary habits of the population. In Milk, Food Aid, and the Narrative of Lack I spoke of dismantlement: indeed, local food systems can only be integrated into the global corporate food system through the dismantlement of their traditional structure and elements. For example, the move to a large-scale, centralized tortilla market is paired with the disappearance of biodiverse corn-based agricultural systems, small local retail outlets for traditional farmers, and the loss of their knowledge as they are forced to migrate towards other opportunities for subsistence. 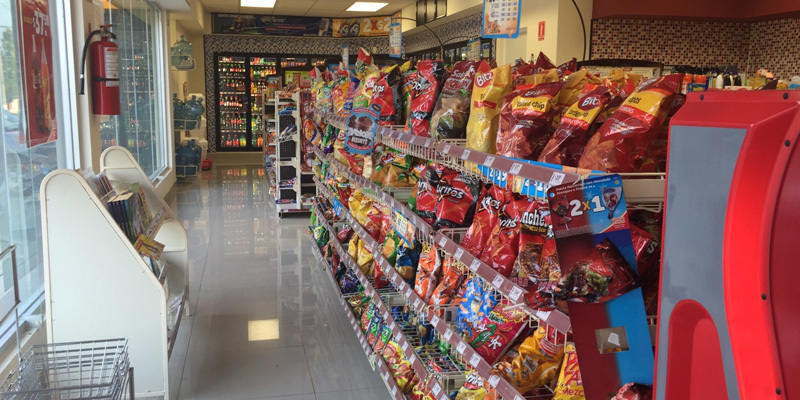 Inside an OXXO, the largest convenience store chain in Mexico. OXXO is owned by Femsa, which also owns Coca-Cola Femsa. Through a variety of mechanisms, globalization and corporatization of food systems have led to a drastic shift in dietary habits, characterized by an increased consumption of both highly processed foods and animal foods, and a decreased consumption of nutrient-dense plant foods. This leads to the “double burden” affecting an increasing number of countries in the Global South: malnutrition and obesity. Mexico is an unfortunate leader: its long-time epidemic of malnutrition is unabated while obesity and diabetes become ever more severe. It is in this context that milk is delivered to malnourished populations as a panacea. Around the world, milk is marketed both as a necessity and as the default children’s food – a symbol of basic needs met. Led by a partnership between a dairy rancher association and federal agencies, this campaign aims to persuade consumers of the importance of milk for health. Currently, the main nutritional selling point for milk is calcium and this marketing has been so successful that it has established the belief that other adequate sources of calcium do not exist. The irony is that in Mexico, other sources of calcium not only exist, they are front and center. Tortillas, the very staple of Mexican food, are traditionally made with corn that was processed in a way that renders them highly rich in calcium. Yet, the disappearance of traditional tortillerias has led to a decrease in the nutritional quality of tortillas. Tortillas are also increasingly replaced by bread, which further limits calcium consumption. While the narratives that accompany food aid often paint a lack that is either false or created, malnutrition is real. 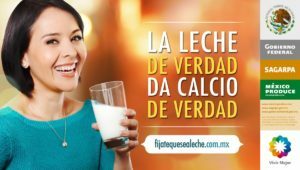 Zinc and iron deficiency are common amongst Mexican children , but social assistance is centered on milk, which has neither. This mismatch indicates at least two things: first, food distribution is more about benefiting donors than addressing the real needs of recipients; second, the symbolic appeal of milk is powerful indeed. 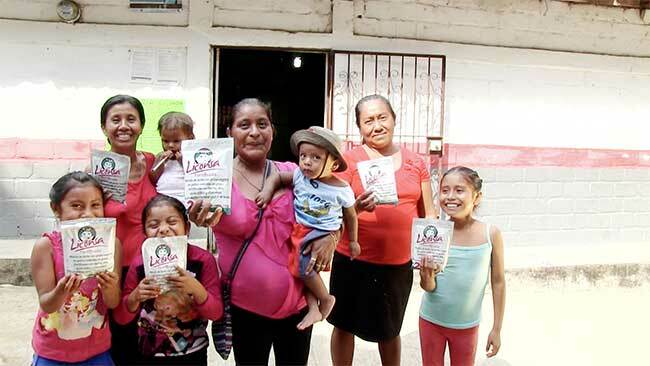 Widespread iron and zinc deficiency are due to politics of poverty and hunger and do not point to an inherent lack of these nutrients in traditional Mexican food systems. As with calcium, there are no a priori reasons Mexican children should be deficient in iron and zinc. On my trip to just one region of Chiapas last year, the existence of local, native sources of these nutrients became abundantly clear. Pozol is a hearty corn drink that indigenous Chiapanecans equate with strength, health and immunity. In the past it was consumed daily; now it is being replaced by milk and coke. Pumpkin seeds are native to Mexico and notoriously high in zinc. In Chiapas, a variety of indigenous and introduced greens have traditionally been harvested around milpas and in wild areas. People spoke to me in particular about hierba mora, a local green reputed to make one strong. 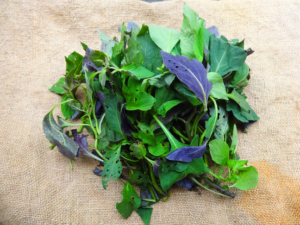 Hierba mora is easy to prepare – like spinach or collard greens – and likely has a comparable nutritional profile. These foods are disappearing from the diets of the population because of systemic changes to their food system. In San Cristobal, pumpkin seeds have become surprisingly expensive and beyond the means of many people, but one woman told me that growing up, tortillas with ground pumpkin seeds were a daily go-to snack. The nutritious greens that were once ubiquitous are being lost as many move to the city, unable to make a living as farmers. Those who continue to farm now use herbicides, killing off the greens that once grew spontaneously. Even in the countryside, people have access to less land, which limits both the amount and variety of food they can grow. The woman who spoke of pumpkin seed tortilla rolls told me that in her childhood, it was normal for every family to have an avocado tree, and now it’s a rarity. And though avocados abound in the farmers markets, they are not cheap. Fried foods and animal fats have largely replaced the healthy fats once easily available. It is absolutely possible for these foods to be made accessible again with policies that help build local, biodiverse food systems. Indigenous and peasant movements are fighting for just that – their vision is based on recognition of the abundance to be found in their ecosystems and traditional knowledge. In contrast, the marketing of milk and many social assistance programs are based on the myth that they fill a void that exists by default. The Encuesta Nacional de Nutrición (National Nutrition Survey) of 1999 found that half of Mexican children under two, and a third under five, were anemic. Interestingly, it also found that iron consumption levels were sufficient, but that children weren’t absorbing it properly. It is common knowledge that consuming vitamin C with plant-based sources of iron increases its bioavailability, and the report indeed points to low levels of vitamin C as a probable factor in the anemia rates. In other words, eating more produce might have been a simple step towards decreasing anemia. To address the causes of malnutrition, we must turn our attention to a global economic system that mandates that produce be flown hundreds of miles to well-stocked grocery stores, while the children who live near where it is grown consume one of the world’s highest rates of soda. Biodiversity and complex food cultures are not unique to Mexico; the traditional food systems of other countries also contain foods that are nutritious and calcium-rich. Yet in so many countries, school milk programs are implemented with the explicit purpose of creating a culture of milk consumption. This goal is always coupled with that of “teaching children healthy habits.” Around the world, we’re being lulled by a modern tune that says that this one singular food, created by animal mothers of another species for their babies, and traditionally consumed by only a minority of humans, is paramount for the development of human children. Liconsa is being rapidly expanded in areas with the lowest Human Development Index, i.e. rural indigenous regions. Liconsa is a federal program that distributes milk to disadvantaged populations, such as low-income children, pregnant women and nursing mothers. It has existed since 1944 and its coverage is in continual expansion. Liconsa started to fortify its milk with iron in 2001[ 4], because why feed children foods that are naturally rich in iron and vitamin C when you can fortify “nature’s perfect food” and make it extra perfect? Studies that measure the effects of consuming fortified Liconsa milk find, unsurprisingly, that it is an effective way to redress anemia. However, childhood anemia was a noted problem in Mexico for decades  before Liconsa started fortifying its milk. The benefits of fortified foods for malnourished children are much touted today, but fortification is evidently a post-facto justification for the program. Milk distribution is not based on an objective assessment of needs but is instead legitimized through the representation of milk as the default nourishment for children. When it comes to milk, a departure from Western norms is perceived as a lack instead of a simple difference. Most traditional food cultures do not include dairy, so naturally they are targeted for change. Children who don’t drink milk are portrayed as lacking proper nourishment, or even just “food”, since milk is framed as the generic, universal children’s food. Conversely, it is suggested that any deficiency can be remedied with milk, even when the milk needs to be supplemented so as to alter its nutritional makeup. We must of course address the root causes of hunger and build up local food systems, but some forms of food aid will still be necessary, for example in the short term and in emergency situations. And fundamentally, providing healthy meals to schoolchildren is a good idea. In these cases, the needs of recipients should be given priority and addressed objectively, away from industry input, cultural bias and emotional appeal. Currently, our representations of proper children’s food are shaped by Eurocentric norms and by the powerful association of milk with motherhood, childhood and nurturing. Through this biased lens, we allow for policies that harm those they purport to serve. In the process of nixtamalización, corn is soaked in a slaked lime solution, which can increase its calcium content by 750%, amongst other benefits. Morales-Ruán Mdel C, Villalpando S, García-Guerra A, Shamah-Levy T, Robledo-Pérez R, Avila-Arcos MA, Rivera JA. (2012, Mar-Apr) Iron, zinc, copper and magnesium nutritional status in Mexican children aged 1-11 years.Salud Publica Mex. Instituto Nacional de Salud Publica (2004) Impacto de la leche fortificada Liconsa en el estado de nutrición de los niños beneficiarios del Programa de Abasto Social. Instituto Nacional de Salud Publica. Rosado JL, Bourges H, SainT-Martin B, (1995) Deficiencias de vitaminas y minerales en México. Una revisión crítica del estado de la información: I. Deficiencia de minerales. Salud Publica Mex. To learn more, read my post about the global importance of the School Milk Industry. Nassim Nobari is the Co-founder and Director of Seed the Commons. As a long-time social justice activist, she sees the transformation of our food systems as key to achieving a more just world. Her unique programs help build the food movement while promoting animal liberation instead of farming systems based on animal exploitation. Nassim holds a Masters in social psychology and is fascinated by the ways in which social norms are maintained and transformed. She has been studying the global spread of dairy consumption as an example of dominant groups shaping dietary norms. For more of her writing, visit her blog.